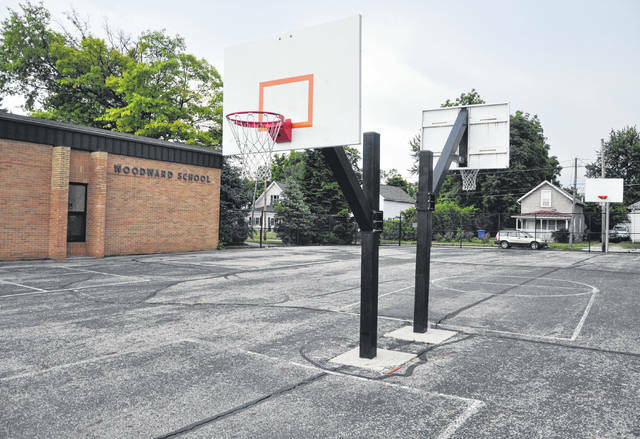 Pictured are several of the basketball courts at Woodward Elementary School in Delaware. The Delaware Police Department will hold its sixth annual youth basketball camp from 9 to 11 a.m. on July 9-11 at Woodward Elementary School. The camp is free to attend for boys and girls who are entering fifth through seventh grade, but the camp is limited to 50 participants and will be accepted on a first-come, first-serve basis. A link to the registration form can be found on the City of Delaware website in the police services and programs section. Completed registration forms can be submitted to the Delaware Police Department, located at 70 N. Union St., or emailed to Officer Joseph Kolp at jkolp@delawareohio.net. Questions can be submitted by email or by calling 740-203-110, ext. 2164. Kolp said Detective Sean Franks first organized the camp six years ago because he wanted to find a new way to connect with the youth in the area. Franks decided basketball was a shared passion between the community’s youth and the police department that would provide some common ground. “The game of basketball is a great tool to teach character building skills such as teamwork, accountability, self-confidence and discipline that we can use both on the court and off the court,” said Kolp. Campers will participate in drills, games, and contests that will focus on building the fundamental skills of basketball. But the police department utilizes the camp as a platform to educate kids on more than just the game of basketball, mixing in discussions about the importance of maintaining an active, drug-free lifestyle. Those participating should wear standard athletic gear and bring a water bottle. Weather permitting, the camp will be held outside and sunscreen may be necessary. The police department advises all campers to leave any valuables at home. All officers participating in the camp are volunteering their time and most have experience playing organized basketball or coaching youth sports. Kolp hopes that in addition to the kids developing as basketball players, lasting relationships will also be developed between the campers and the police department.